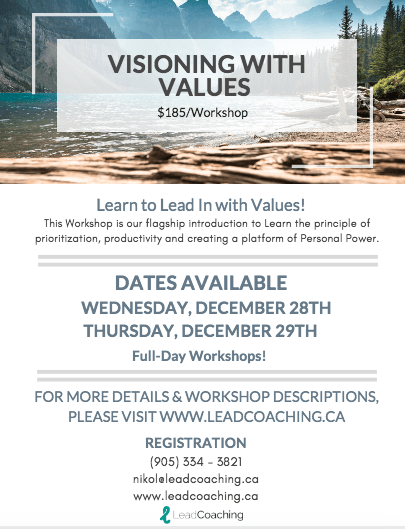 VISIONING WITH VALUES – Why New Years resolutions and behavioral goals don’t work and a coach approach to what does work instead! Offered just before New Years as a gift of creating a future year that excites, inspires and ignites! This workshop is a great focus session and overview of key components to setting intentions that are actually effective. Don’t set your self up with another list of missed resolutions, LEARN to LEAD IN with Values, Vision and Creed to create your best year yet. This Workshop is our flag ship introduction to Learn the principle of prioritization, productivity and creating a platform of Personal Power.